Evan, the cornerstone, revealing Mashiach. A couple weeks ago, as we studied Devarim (Deuteronomy) 32, verses 30 and 31 stood out to me. It led me on an interesting study of the word ‘rock’ and that title for Yahweh and/or Messiah. Admittedly, the Hebrew word used in Devarim is not the same as the word meaning ‘stone,’ but the connections are obvious. For this reason a man shall leave his father and his mother, and be joined to his wife; and they shall become one (echad) flesh. Rabbi Shapira makes the point that numerous rabbis understood ‘stone’ as an illustration or title of Mashiach. A prime verse is Zechariah 4:7! Without pursuing Rabbi Shapira further, though I highly recommend his scholarly work, I want to look at a few other places we see the word ‘stone’ associated with the Mashiach? You were watching as a stone was cut out, but not by human hands. It struck the statue on its iron and clay feet, breaking them in pieces. Daniel 2:34. Daniel relates a vision that pictures Mashiach destroying the kingdoms of men and establishing His own everlasting Kingdom. 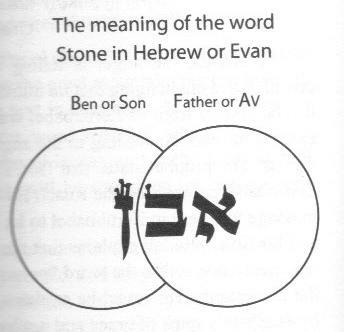 Our understanding of the Hebrew word ‘evan,’ or ‘stone,’ sheds some light on this misused and seeming mystical passage. Simon/Shimon rightly identifies who Yeshua is. He is none other than the Mashiach, Son of God. THE STONE the rabbis were looking for, as it were. Yeshua proceeds to refer to Shimon by his Greek name, Petra* or Petros, meaning ‘rock,’ and points to Himself as ‘this rock’ that is the corner stone! Peter then has an understanding, later revealed in his first epistle, that Mashiach is the prophesied foundation stone, with himself and the rest of us being living stones to be built into a living temple. *Like some, I believe it is possible the Gospels were originally written in Hebrew, then translated into Greek yielding the manuscripts we have today. If such is the case, Yeshua would have referred to Shimon as ‘Tsur,’ the Hebrew word meaning ‘rock.’ Either way, the point of the conversation remains the same. I pray this little study has blessed you. This entry was posted in Deeper Study and tagged Apostle Paul, Christian, cornerstone, Hebrew Roots, Itzhak Shapira, Kosher Pig, Messianic, Rabbi Shapira, rock of offense, roman catholic, Sabbath, stone, theology, Yahweh, Yeshua, YHWH. Bookmark the permalink. 12 Responses to Evan, the cornerstone, revealing Mashiach. the fullfilment of the Jonah Prophecy. Do you agree? I do believe He was raised at/near sunset as the day turned toward the evening of First Fruits. Scripture indicates He was already risen when the ladies came to the tomb before sunrise. We are given no indication how long before that point He was raised and the Jonah prophecy does say ‘three days and three nights’ which is impossible with any counting that ends at sunrise if He died at/near sunset.